Adenoids are masses of lymphoid tissues that are located right behind the nasal passageways, behind the nose. They are a part of the body’s immune system and play a first-line defensive role along with the tonsils. They act as a filter by keeping harmful germs that travel through the nose or mouth from entering further into the body. Adenoids also produce antibodies which protect the body from infections. Unfortunately, sometimes the adenoids can negatively impact the body instead of defending the body when they become infected. Having inflamed or enlarged adenoids are called Adenoiditis. Symptoms of infected adenoids include recurring bacterial infections in the nose or throat, or enlargement of the adenoids resulting in an airway obstruction that affects swallowing, breathing, difficulty sleeping, and snoring. Adenoids are usually overlooked during regular physicals or exams due to their inaccessible location behind the nose. They are in the top of the throat near the roof of your mouth. Special instruments that your ear, nose, and throat (ENT) doctor would have easily accessible are needed to access the adenoids. Most general medical doctors would not have these instruments accessible during a routine checkup but they may suggest taking a few x-rays in order to see the adenoids and any inflammation that might be occurring. Adenoids play an important role in the early years of development – up to around age 6. As you get older, your body starts to fight infections in other effective ways and the adenoids will actually start to shrink in size due to non-use. In most cases, your adenoids disappear by the time you are a teenager, hence most adenoid related problems are seen in small children. The tonsils and adenoids are similar in that they are made from the same type of lymphatic tissues; however, the two are completely different masses. The two differ because diseases caused by infected adenoids differ from diseases from the tonsils due to their precarious placement behind the nasal passageway. Small pockets inside the tonsils sometimes produce compact, odor smelling deposits (frequently referred to as tonsil stones) that could irritate the adenoids and cause soreness or swelling. You should consult your doctor to determine whether an adenoidectomy needs to be performed. The surgical procedure where a surgeon removes the adenoids is called and Adenoidectomy. Adenoidectomies and Tonsillectomies were typically performed together during most of the twentieth century. Up until recently, the procedures seem to be performed separately or individually. Most adenoidectomies are performed on children in general. The first adenoidectomy dates back to the 1800’s when doctors theorized that the adenoids were the culprit for certain nasal problems and impaired hearing. The procedure is one of the most frequented surgeries done in the U.S. and is most commonly performed on children under the age of 6. Adenoidectomies are performed by ENT surgeons. The procedures are typically done at an outpatient surgery center where general anesthesia is administered. The adenoids are removed from the mouth so there are no other incisions or cuts inside the mouth besides the actual removal of the tissue. Since the surgery is typically done in an outpatient environment, patients usually go straight home once the procedure is completed and has had a successful recovery period following the procedure – about 5 hours. This time frame can fluctuate based on the patient’s performance during surgery and how quickly they awaken from the anesthesia. It is common to experience a low-grade fever for 1-2 days following the surgery. Don’t panic unless the fever has reached over 102 degrees Fahrenheit. Make sure you consult your doctor or surgeon if the fever progresses and especially when nausea, vomiting, or a stiff neck occur along with the fever. Since the surgery is performed in the upper back of the throat, you can assume that the throat will be sore for up to a week and a half. Eating, drinking, and talking will be difficult at first but will progress during each day of recovery. The throat will be sore and you will experience pain there and possibly also in the ear. Pain may persist for several weeks after the surgery. Everyone is different with recovering from this surgery, so you may not experience much pain at all or it could last weeks. The throat tends to swell after the surgery so it may feel like you are having difficulty breathing. Breathing through the mouth should get better during every day of recovery. Breathing should return to normal within two weeks following the procedure. The throat will be tender immediately following surgery and you will most likely be hungry but you may not want to eat due to some pain. 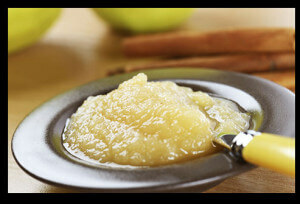 Start eating slowly with the following soft foods. You can add harder foods as the days progress and the pain and swelling start to diminish. Try to avoid milk-based products for at least 24 hours. It’s important to remain hydrated at all times, especially following a surgery where you are asked to fast for up to 8 hours prior. You want to avoid dehydration at all costs. No one wants to return back to the hospital right after leaving, right? 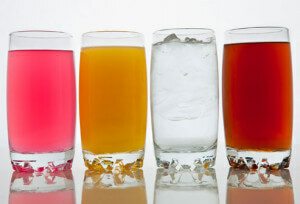 Hot liquids might worsen the pain, so stick with room temperature or cold drinks initially. The best thing you can do during surgery recovery is getting plenty of rest. Whether the surgery is performed on a child or adult, make sure Netflix is paid and up to date so you can have some movie marathons either way. If the surgery was on your child and they are typically very active, reading stories and doing activity books are good ways to keep them occupied without moving around too much. Sports and vigorous movement should be avoided for at least a week, but check with your doctor regarding activities. Be sure to follow the doctor’s orders as far as what medications to take. Consult your doctor if you have questions regarding taking multiple pain medications at once or in intervals. Your doctor may also instruct you to ice part of your neck or face in order to reduce swelling. Always follow your doctor’s orders. 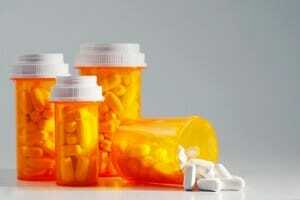 It’s important to finish all medications prescribed by your doctor, especially after surgery. In the rare event that an infection may occur, you want to be sure your medication completely prevents or eliminates the infection so always finish antibiotics that are prescribed by your doctor. Adenoidectomies are commonly performed and are considered a routine procedure, however in the rare event that something goes wrong, you should be aware of the following warning signs and reach out to your doctor or go straight to the emergency room. It is common to have some dark red bleeding occur in the mouth or nose immediately following the procedure, but after a day or so the bleeding should stop. If bright red blood is seen in the mouth or is coming from the nose, this may be an indicator that something more serious is going on. Consult your doctor immediately. Breathing might be difficult immediately following the procedure, but it still possible. If breathing becomes extremely hard or wheezing occurs, there may be serious inflammation occurring that is blocking the airway. Head to the emergency room and call your doctor in the rare case that this occurs. It is common to experience a low-grade fever for several days following the surgery, however, if the fever exceeds 102 degrees, this may signal a more serious infection. Monitor a low-grade fever and check in with your doctor if it gets too high. If vomiting and nausea occur along with a high fever (102 degrees+) this is usually another indicator of an infection. Seek medical attention from the ER and consult with your doctor. Inflamed adenoids can be a common cause of snoring in children and occasionally adults. Snoring is caused by a blockage in the mouth, nose or throat. The blockage forces the tissues of the airway to vibrate when the flow of oxygen passes from the mouth or nose to your lungs. Inflamed or infected adenoids may be the culprit of the airway blockage and therefore may be the reason you snore. Congestion and chronic sinusitis may occur from infected adenoids as well. Adenoids may vibrate during this blockage and the narrower the airway is, the more these tissues will vibrate, resulting in even louder snoring. Loud snoring can be extremely difficult for you and your partner. 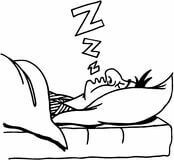 Snoring can cause you to have a less restful sleep by not falling into a deep sleep. Snoring can upset your partner and lead to separate issues in bed. Snoring can lead to more serious conditions like high blood pressure or sleep apnea. 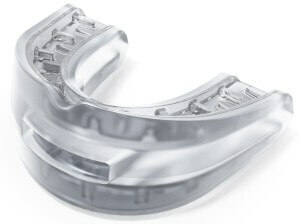 There are several tongue stabilizing devices and mandibular advancement devices that can be prescribed by your doctor that can aid in stopping snoring or help with sleep apnea. These can be a more cost-effective solution for stopping snoring instead of paying for a surgical procedure like an adenoidectomy. Nose cones and nose vents are a few nasal devices on the market that can open the airway which helps to stop sleep apnea and snoring. This is also another cost-effective and a less invasive alternative. Positional therapy is a more natural approach to stop snoring. This treatment for snoring involves realigning your body in a natural, comfortable position while you sleep in order to bring your body back into balance and promote healthy breathing. Palatal implant therapy often referred to as the Pillar procedure, is another out-patient surgery that can be performed to strengthen the palate and ultimately prevent your mouth tissues from vibrating which result in not snoring. Small polyester implants are surgically placed in the mouth. The combination of the implants and the body’s natural scarring and healing process makes the mouth tissues stiff and less likely to vibrate. Similar to the Pillar procedure, injection snoreplasty is also another out-patient procedure that involves injecting a chemical into the palate. The scarring and inflammation naturally cause the mouth tissues to become stiff, resulting in a decrease in tissue vibration and thus a decrease in snoring. This procedure often requires multiple office visits and several injections. It is less expensive than an implant but is said to be more painful and have a longer recovery time. Radiofrequency is another palate-stiffening procedure that is done to stop snoring. Under general anesthesia, a heat treatment is used to stiffen the tissues. This technique costs less than the implant procedure, but a bit more than the injection treatment. 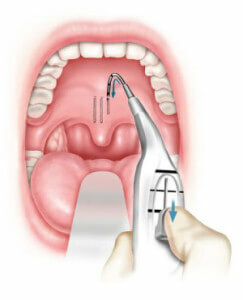 A tonsillectomy is another procedure that may help you stop snoring. Like an adenoidectomy, this surgery is almost identical as far as the procedure and recovery time go. The only difference is that the tonsils are being targeted instead of the adenoids. Sometimes the two procedures are done simultaneously as well. It’s best to consult with your doctor on which stop snoring method works for you. If you are interested in reading more about our preferred stop snoring devices, please look at our recommended products here. Next post: Is an Injection Snoreplasty a realistic solution to Stop Snoring? 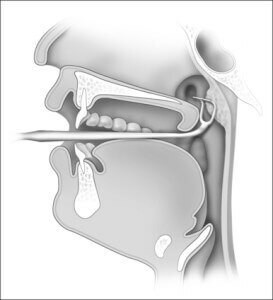 Previous post: Tonsillectomy and Snoring – What’s involved with this procedure?